In this post you will find some information about breakfast customs around the world and making own Müsli. Okay, you maybe know it as Muesli, in the South and in Switzerland they write it Müesli, but I'll keep the standart German way of orthography. Every country and every continent has its own customs for breakfasts. The more North people live and the rougher the climate is the more fat and opulent the breakfasts are. That's one of those wisdoms I learned on my trips around Europe and the Wikipedia article - READ IT HERE. Here in Germany or better said in Central Europe where I was born and raised we are blessed with the influence of different cuisines and customs. Every one can pick out exactly that kind of breakfast that fits to ones personal lifestyle habits. What is a typical German breakfast? Let's start with the point that a lot of people and I know a lot of friends of mine never have breakfast. But generalised said coffee or tea and buns and bread with marmalade, cheese or cold cuts are common. My parents use to have such breakfasts and sometimes also scrambled eggs or sausages. My stomach rebels when I only think about having scrambled eggs or something opulent in the morning. Maybe it's because of my Mediterranean way of life and the fact that I am a night owl and for the first 3 hours after I wake up I feel like a body, how my friend calls it. It's midnight, Deutschlandfunk I am listening just played our national anthem and now the anthem of Europe - "normal" people are already sleeping and me, the night owl is drinking coffee and writing on my blog. My breakfasts are totally different. During the week I never leave the house without having eaten something. Monday to Friday I have Müsli with milk (very rare cornflakes) and 3 hours later a second breakfast - a sandwich with cheese or a piece of cake. I always split my breakfasts in two parts. It's not because I wanted it, it's because I was taught to do so since my childhood. My dad always ate hearty dishes for breakfast, my mom a roll with marmalade and coffee or tea and I HAD TO eat Müsli or cornflakes. How I hated it when I was a child. I got a bowl with cornflakes and the order to eat. I think it was one of those few things I ate, because I was a horrible eater for the let's say 14 first years of my life. Sorry mom and dad! But later I kept that system and now I enjoy my bowl of Müsli. I get up much earlier I would have to, I drink my coffee, eat my my Müsli and read the newspapers in the morning. In the Summertime I enjoy it on my balcony watching the beautiful Taunus mountains directly at the gates of the city. During the weekend I never ever have Müsli - Saturday is my bread/crossaint and marmalade and coffee day and Sundays I usually skip the breakfast because I am used to stay a little bit longer in bed and having lunch at noon with granny. I am mixing my Müsli by myself. I would never take to my mouth that mixtures you can buy in the super market. They stink! Really! I can't stand that smell. On the other had they're full of additives, sugar and raisins. And if there's something I hate more than winter, that would be for sure raisins, especially wet raisins. HORROR!!! So today I bought rolled oats, some seeds I like (pumpkin seeds), almonds and nuts and fruits (today papaya) and I mixed my Müsli in just few minutes. In the morning I'll add a chopped banana and hot milk and I will have the perfect breakfast for me. I do not add sugar or honey - I don't need and like it, I enjoy the taste of the oats. I have no idea if it's cheaper than buying that stuff in the grocery. I don't care about it I only know that I get exactly what I like and in amounts I can define myself. But wait, I'll take a look on the shopping bill... Okay, so I'm back. 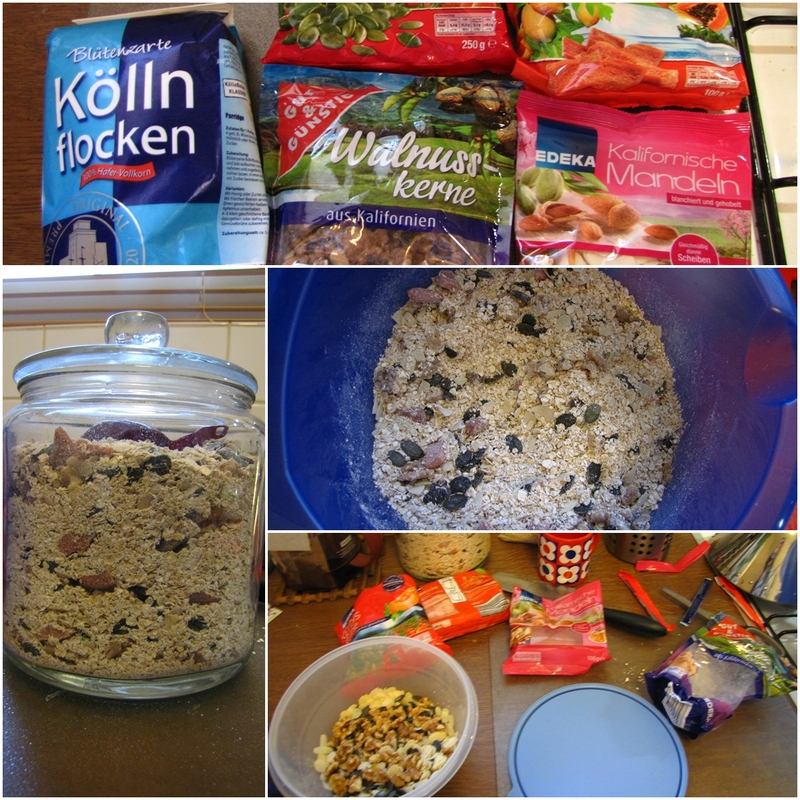 This time I took: rolled oats (1000g), walnuts (200g), almonds (100g), papaya (100g), pumpkin seeds (250g). All together I payed 11 € for the ingredients and I got 1650g Müsli. That's around 3,4 lb Müsli - yeah, that's cheaper than that ready sh*t. Good to know. Because my IKEA jar fits only 1 1/2 lb I used the half of the ingredients I wrote above. The left-overs I put into a hermetic bowl. I'll just mix them with that last package of rolled oats when I'll finish this portion in two weeks.